No color is fresher or crisper than white. So when you wear the hue from head to toe, it looks exceptionally stylish, high-impact look. Just look at fashionable trailblazers such as Nicole Richie, Rita Ora, and Julianne Hough, who take white to new heights in their latest outfits. Whether you want to wear an ivory-hued ensemble at your next cocktail party or work the trend for your next weekend outing, white is always going to work for you. Here are some things you can wear with your little white dress. A solid white base leaves lots of room to play with bracelets of varying sizes, colors and textures. Eva Mendes upped the old-school glamour factor with a simply chic stack of gold bangles, while Nicole Richie showed off her eclectic style with matching bracelets on each wrist and her arm. A dark, crisp jacket lends a chic contrast to white sheaths. Zoe Saldana chose a structured blazer with a draped dress style for a sophisticated evening look, while Kate Walsh gave angelic white an edge with a lightweight motorcycle-style leather jacket. Lustrous silver and gold accessories pop even more against a white canvas. Supermodel Chanel Iman caught our attention with flashes of silver and gold, and Kate Bosworth worked both metals into her look with a gilded clutch and gleaming heels. This neutral hue gives crisp whites a casual, natural appeal. Jennifer Aniston brought an eclectic vibe to her sleek silhouette with a wide textured belt, while Vanessa Hudgens deftly wrapped her shirtdress with a dark, skinny cincher before finishing the look with platforms in a lighter shade. Towering stilettos are the perfect finish to a white-hot minidress. While Diane Kruger got creative with an arty caged design, Jennifer Lopez jazzed up her look with a colored platform and heel. A breezy scarf wrapped effortlessly around your neck makes casual LWDs look chic. Blake Lively skipped the knots and let her brightly patterned scarf hang loose-Alessandra Ambrosio gave her beaded sash a single loop on a leisurely evening stroll. Glistening chandelier earrings can serve as the focal point when wearing a shoulder-baring white style. Selena Gomez’s clustered pair fell within her look’s snowy color palette but a slight shimmer made the pieces pop. A dash of color instantly gives simple white sheaths a stylish direction. First Lady Michelle Obama’s gunmetal belt takes her shift down a more contemporary route, and Cameron Diaz uses her cherry red choice to perk up her girly lace number. A long necklace serves as a stylish centerpiece to draped or structured shapes. Sarah Jessica Parker opted for a single gold chain with an oversize pendant, and Olivia Palermo piled on the layers to add texture to a pretty pearl ensemble. 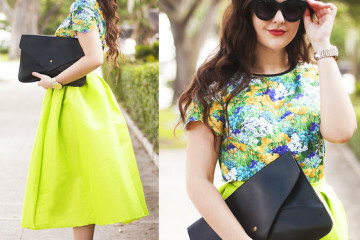 A vibrantly colored clutch adds a playful element and almost every shade matches a white palette. Ashley Greene heat up her look with a spicy minaudiere, while Faith Hill kept her ensemble classic with a cool sky-blue piece.